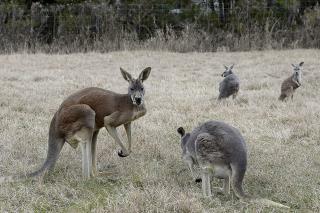 (Newser) – One kangaroo is dead and another is injured after visitors at a Chinese zoo hurled rocks and other objects at them in two separate incidents. The Straits Times reports the first pelting happened at the end of February (though China Daily says it happened in early April), when gawkers decided to throw bricks and pieces of concrete at kangaroos at the Fuzhou Zoo in Fujian province to get them to hop around. A 12-year-old female marsupial was struck on her left foot, per ABC Australia, but although zookeepers tended to the animal's bleeding limb, they apparently didn't account for internal injuries. The kangaroo died a few days later, and a vet's report says it was probably from a ruptured kidney. Like russia, China is basically peasant stick ...cruel , stupid idiots. That should be a huge deduction on their social score. Why were there chunks of concrete and bricks lying around?